We will match or better any genuine price for exactly the same service from a competitor veterinary practice within a 5 mile radius of any of our branches. Written proof of competitor price must be supplied at the time the price match is claimed. The written proof has to be presented at the time the service is delivered. Price match will not be applied to goods or services already provided. Any quote / estimate presented has to be fully itemised and include all the procedures ( including fluids, blood samples etc ), tests and follow up appointments deemed necessary. If in our opinion the treatment being quoted for does not provide the optimum care for your pet we will quote for the optimum care package and not price match. Often services are packaged together ( for example first vaccination course and free microchipping). In this situation we will match the price for the entire package. 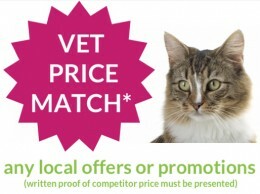 The price match offer can be withdrawn at any time and without notice. Price match is effective for May 2015 and June 2015.